Ahhh... the answer song. Since the beginning of song, someone always had a response for the music played or recorded. It could have been a clap, a boo or a song response. There are tons of examples. Yet, the rap world was a bit more open about it. Yes, one of the most notable are both Roxanne Shante and The Real Roxanne's responses to U.T.F.O. 's "Roxanne." Anyhow, this leads to our two featured songs this week. 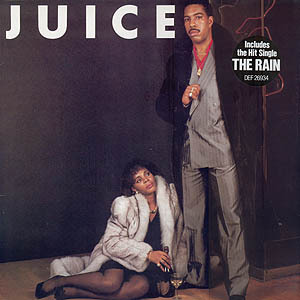 Oran 'Juice' Jones had a huge hit in 1986 with "The Rain" from his Juice album. The song got a response later that year with Miss Thang's "Thunder And Lightning." Got to say that there are some hilarious lines in the response song. But, this show is definitely about showing you other facets of what made up music scene of the time. It's not often that you get to hear both songs together let alone find a copy of "Thunder And Lightning."